So I got the chance to work with some of my very favorite creatives to come up with this shoot for BHLND. Ava and Cory are one of my couples their wedding is in April so this won’t be the last time you see them. Ava will be wearing BHLDN for her actual wedding as well. 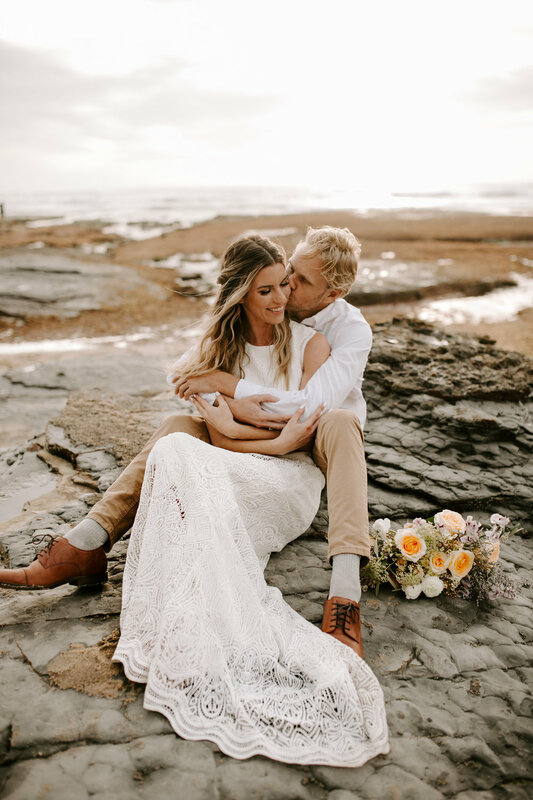 So the dream team and I got together to conceptualize this Sunset Cliffs Elopement. We came up with this neutral toned and dusty purple color pallet. So Katie our amazing florist put together this incredible bouquet as well as the floor piece. Then Corie worked her magic and gave Ava some awesome beach waves. We decide to shoot here in Ocean Beach. I preemptively bought a couple smoke bombs for this shoot. SO we all went to the cliffs and created this awesome styled shoot.